A peasant, lining in the town of Kenfig, once loved the daughter of the Norman Earl of Clare, but she refused him because of his lowly status. To obtain money he killed and robbed the local lord. He used his ill-gotten gains on grand clothes and general show of ostentation. Impressed, the girl promised to marry him. At the wedding feast, just as the guests were beginning to enjoy themselves, a voice was heard crying out a warning of vengeance. The guest asked obvious questions such as ‘Why?’ and ‘When?’ but merely received the reply, ‘Vengeance will come at the end of the ninth generation.’ They all laughed at this for none of them thought they would live as long as that. But they did and one day a young man arrived in the town and announced that he was the ninth descendant. The voice was heard again, threatening vengeance. In fear the people fled indoors but it was of no avail, for suddenly there was an inrush of water and the whole town was overwhelmed in a large lake. Above the waters could be seen only a few chimneys, still smoking. On the surface were found gloves of the murdered man, which floated towards the newly-formed shore. There they were deposited at the feet of the young descendant. A voice was heard in the sky praising God. 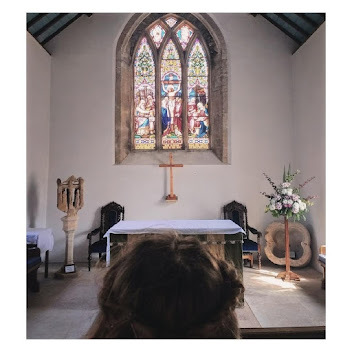 To this day the legend has it that, on a quiet day when the water is clear the houses of the old town can be seen at the bottom of the lake; and if one listens carefully the bells of the old church can be heard ringing-- always, it is said, just before a storm. It is a pity to spoil a good story, in this case, it would be historically satisfying to do so; and a glance at the sketch-map will do this. 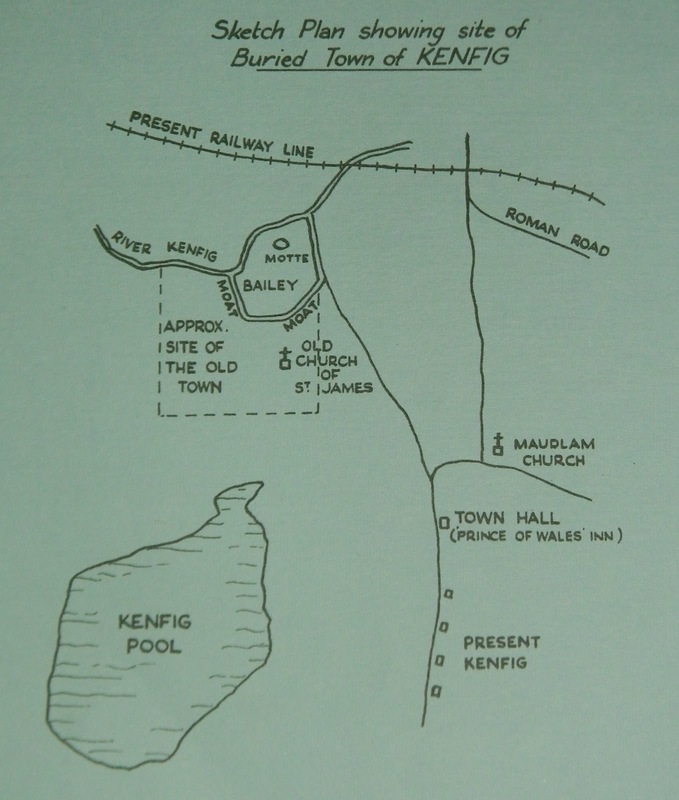 The old town of Kenfig was quite a way from the lake and so the houses can not possibly be under the water: and, even if it were physically possible for the bells to be heard ringing underneath the water, it will be seen that the town’s church of St. James was nowhere near the pool. This information will doubtlessly do nothing to dispel the stories of the bells ringing under the water which local children still tell today. 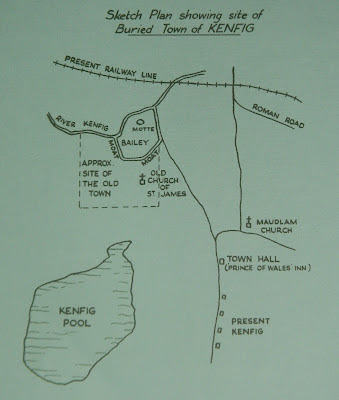 Louvain: "As a child a remember visiting Kenfig Pool with the junior school that was attending at the time. I will always remember standing in the water looking for the houses, chimneys’ and listening out for the church bells!"